We are delighted to announce that Chetham’s recorder player Alastair Niven reached the final of the Birmingham International Recorder competition 2018. The competition, held at the Royal Birmingham Conservatoire on the 16 and 17 February, formed part of the Birmingham International Recorder and Early Music Festival. 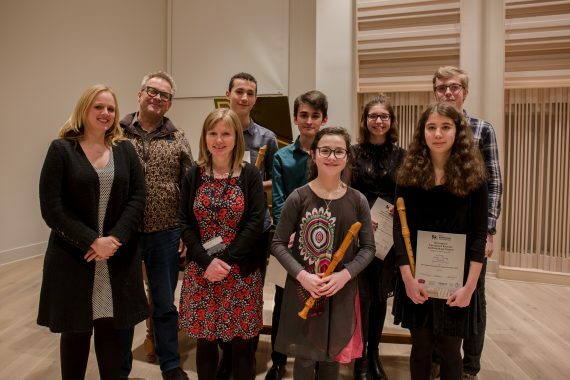 Three of our talented recorder students, Alastair Niven, 16, Anna Williams, 13, and Mabel Dalgleish-King, 12, were selected to take part in the Birmingham International Recorder Competition. On reaching the final Alastair gave a magnificent performance of works by Detri, Telemann and Chiel Meijering. Congratulations to Alastair, Anna and Mabel on your achievements! Chetham’s recorder tutor Chris Orton was on hand to give encouragement to our performers, and was also involved in the festival where he gave a number of recorder masterclasses to delegates. Since winning the Moeck/SRP International Solo Recorder Competition in 2007, Chris Orton has developed an international reputation as a recorder soloist, conductor and educator. Alongside his work at Chetham’s, Chris teaches at the Royal Birmingham Conservatoire and Royal Northern College of Music, where he is the principal recorder teacher, and conducts the National Youth Recorder Orchestra.